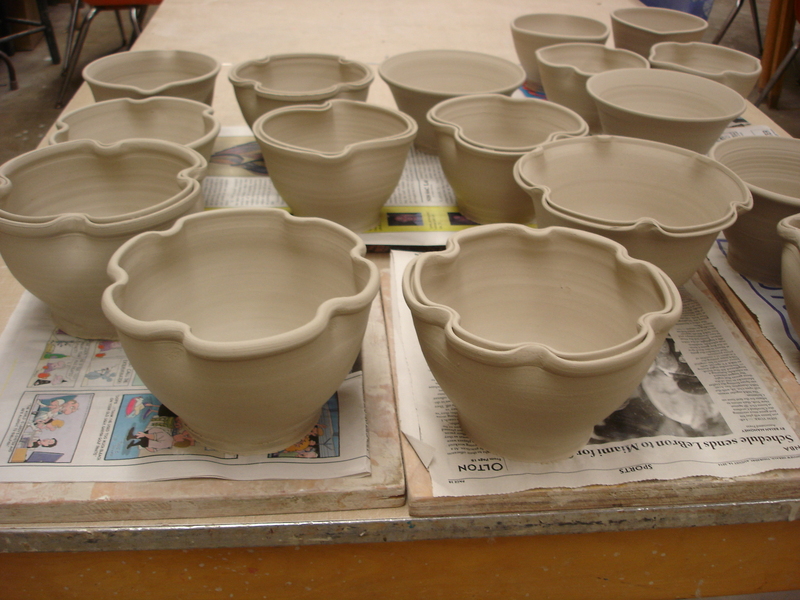 I’m in bowl making mode at the moment; planning an Empty Bowls event to benefit the local food bank. Freshly thrown bowls with altered rims; waiting to dry so the bottoms or ‘feet’ can be trimmed. This one is about 8″ tall, again, cast in a single piece. 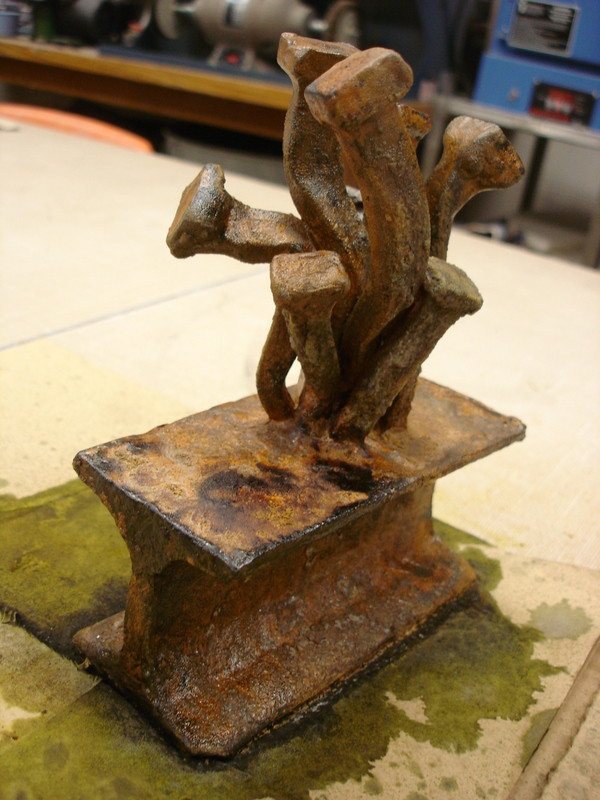 A while back I posted an image, maybe two, of some wax sculpture that was to be cast in iron. 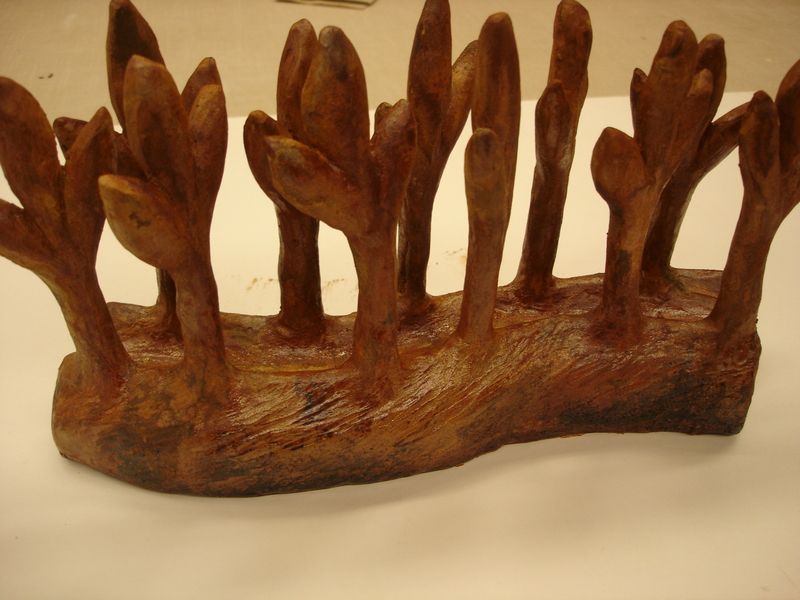 Here’s an example of a finished cast iron sculpture. It’s about 12″ long, cast in a single piece, no welding. Last year, I planted peppers and cherry tomatoes in home made grow bags made from cat food bags. This year, I’m making more of the home made bags but I’ve bought two dozen commercial bags, also. These ollas are designed to fit into a tall, narrow space such as a grow bag. 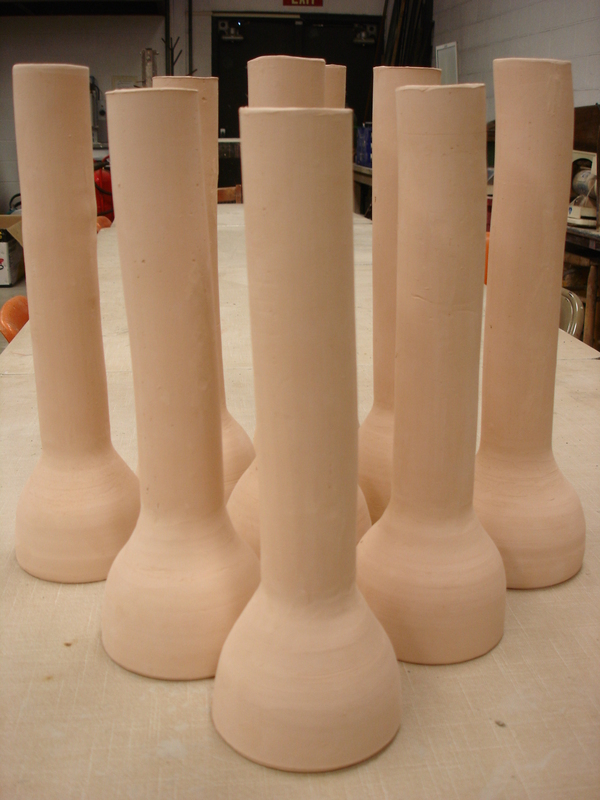 They’re about 5″ wide at the base, 16″ tall, and the tube is a little shy of 2″ inside diameter so a garden hose or watering can will easily fill it. They hold between 5 and 6 cups, not including the water they absorb. I’ve not yet decided on what style of lid they will use. I built a new raised bed for potatoes using old corrugated barn roofing and electric fence posts. It won’t win any awards for beauty, that’s for sure! When it comes time to ‘dig’ the spuds, I’ll just remove one side and let ’em come rolling out to Daddy! I have 16 Russet seeds in there. I also, for the first time, quartered and seared them, so we have a whole new experiment going on with this bed. All of my potato crop is set up to ‘hill’ this year. That’s a first for me. I’m hoping, by using a hilling process, to double my yield from last year. I estimate that I can hill these another two feet! Here’s a sample of the 1/3 gallon olla batch that I’m working on. I need two more hit my goal of a dozen over the Easter break. Tomorrow I make those two, attach labels on eight, and make twelve lids. Almost through with the batch! We’ve had two straight nights of rain showers; not much, but wet stuff from the sky has been hard to come by these past three years. Next will be some one gallon versions so stay tuned! I’ve built a small greenhouse for germinating seed and doing some hydroponics. I used two livestock panels set inside of a 2 x 6 frame. Next I have to get some real greenhouse covering and ‘skin it out’! Should be a lot of fun in the West Texas wind! Here’s a fresh batch of one pint ollas. Perfect for small containers. Some of these are going to the local Master Gardener class. I present an olla making workshop for them tomorrow night. Should be loads of fun! I’ve built a green house! It’s really small; 7′ x 8’5″ on the inside. I was able to get the end walls and door/window vent framed up this afternoon just before the rain came in! Hopefully the drought won’t be as bad as it has been for the last three years.